Pet gates and crates for your home - A Pup’s Perspective - Richell USA Inc.
Hello, Richell USA blog readers! My name is Timber. I’m a female Welsh Springer Spaniel. The wonderful humans at Richell USA have given me the opportunity to blog this month and tell you about their pet gates and crates as well as my first time ever in front of the camera. It’s also an extra special thing for me to do this month because I was born St. Patrick’s Day 2016. Yep! I’m one-year old this month. Or in human years I’m a second grader. Either way, I’m excited to share my story with you about all the Richell USA products I starred alongside with! Find out why my mom loves the easy to use Convertible Elite Mesh Gate for our home! The first time I was called to set was for the Richell Convertible Elite Mesh Gate. This pet gate can be used as a pen, a freestanding pet gate, or a room divider to keep your pet in one area. Of course, I don’t know why any human would to be “divided” away from me and deprived of my company… I am the star after all. I did watch as the humans changed the configuration of the gate without using any tools. I know they all liked that. And I will say that the bronze color and elaborate metal screen looked great in the home. Thanks to the One Touch Gate II, I’m never locked away in a room from my family. 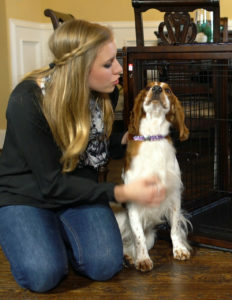 See why the gate is a great product to have for dogs like me. Our next scene was with the Richell One-Touch Gate II. I stood on the other side of the pet gate with my human co-star, Nicole. The gate mounted against the doorway using pressure mounts with rubber stoppers so it wouldn’t damage the paint. It’s called the One-Touch Gate Series and I knew why when Nicole reached down and simply opened it with one hand. That’s a good thing because the one human behind the camera kept telling Nicole to go back and walk through the gate again and to say her lines differently. I know my mom back home will also like how easy the gate is to open when her hands are full of groceries. I did find out this pet gate comes in a wider size and either in an Autumn Matte or white finish to match home décor. Sometimes I need space to play and other times I just want a nap. The Flip to Play Crate is the perfect way for me to do just that! The last shoot of the day was the Richell Flip to Play Crate. This is like two products in one for your pet. It’s a pet crate with plenty of room for your best friend’s bed and toys, and then by simply flipping the top part of the crate over you add a playpen area to it. There’s also a tray, which easily slides out for cleaning. When my co-star flipped the top over, I could walk out of the crate and have my own little area to lounge and play in. All the humans seemed to really like the Flip To Play Crate. In fact, I watched each of them take a turn flipping the top over and then explain to rest of the crew how easy it was. It kinda reminded me of when all my play pals at the park take turns smelling the same tree. Humans… What can you do? Someone has to buy your treats. 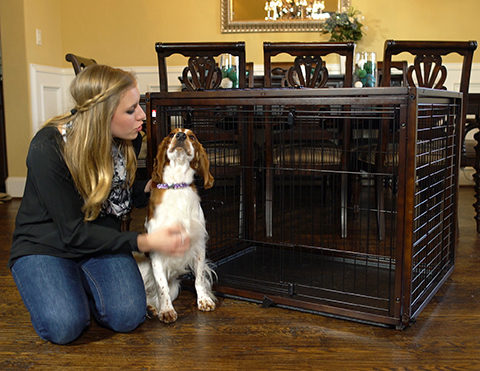 I know that your pets will love these Richell USA gates and crates. And I know that all the humans appreciated the thoughtful design and functionality Richell put into them as well as the way they complement the home. As the one-year old star of this production I give all these Richell USA products a big “paws up”! Please complete this form and click "Submit". Our Customer Support team will gladly address your request and respond in a timely manner.